and we hosted a little soiree for my eldest daughter and her girlfriends for a pre-party to their Senior Class Social. It is like a mini version of prom. Appetizers, and drinks for the parents and sparkling cider for the girls. Yes, I’m 43 and I have an (almost) 18 year old, …. 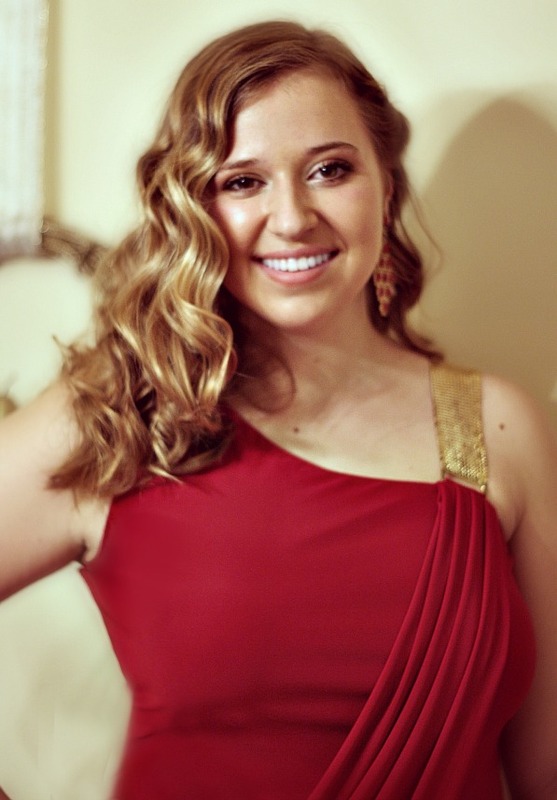 who will be leaving for college soon… gulp… isn’t she lovely? To be honest, I thought I was only turning 42… don’t ask me why, I guess I like to live in ageless denial. When the family gently told me my true age I burst out in tears. Yes, yes, that was completely ridiculous of me, and I think I scared my 7 yr. old, but I seriously did not realize my age. Oh how fast this year has past! Just look how big the kids have grown! Oh why can’t I slow down Father Time? STOP! Someone put a cork in it!!!! Speaking of corks…. if you haven’t already figured it out, this mama loves her wine. I’ve been collecting wine corks for 10 years now. Needless to say I have quite the collection. Some of these corks are from very memorable evenings out and are souvenirs of wonderful memories with the hubs. Disclosure: I did not drink “all” those bottles… I did receive some of the corks from restaurant bar collections (tip: ask your high end restaurants for the corks!). 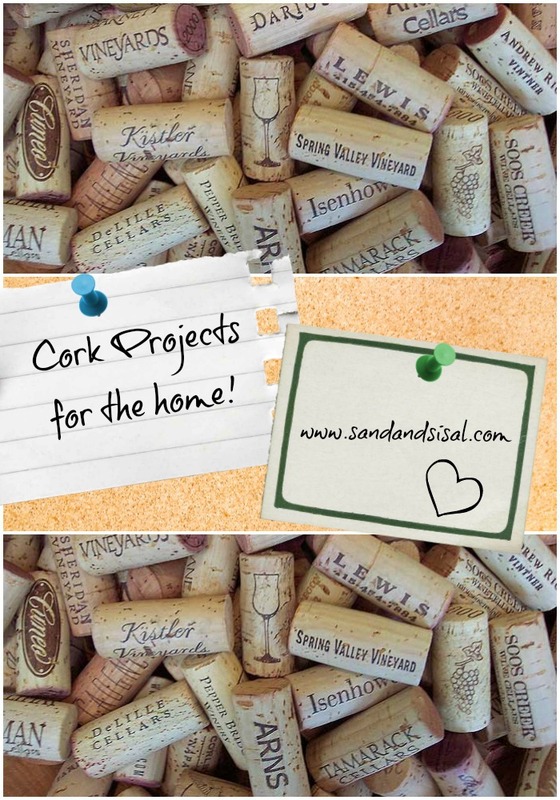 A-hem… anyhoo… Because of my substantial cork collection, I have used the corks in many Cork Projects for our home, just as pictured below. Today, since I’m in a lovey-dovey, melancholy mood, I wanted to make something a bit Valentine-ish. Trust me, this is as easy as crafts get. We’re going to make a Valentine Cork Heart. You will need the following items: I’ve provided affiliate link to buy the supplies on Amazon if you prefer. wine corks (I recommend real corks vs. synthetic) . Step 1) Draw a heart on a piece of paper to the size you desire. Step 2) Line up your corks along your drawing. Place any wine stained cork tips downward on the paper and try to turn any pretty script outward so it can been seen. I recommend using only real corks, not synthetic. Step 3) Once you have all your corks in position, then starting at the bottom, hot glue each cork to the next. You eventually will end up with a beautiful Valentine’s Cork Heart. I recommend using high temperature hot glue. Low temp hot glue will not hold together as well. E-6000 clear adhesive will be even stronger, just be prepared to allow it to dry fully for several hours. 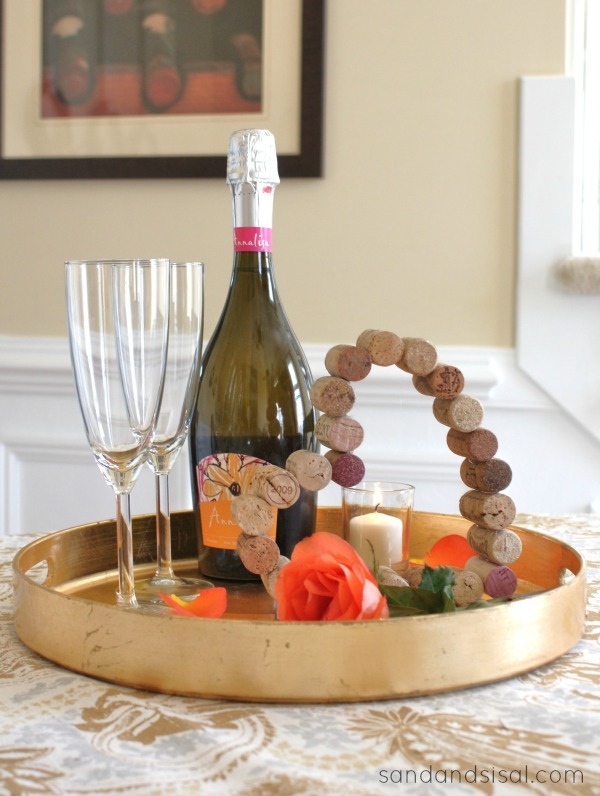 Place the heart on your bar cart, dining table, Valentine’s mantel, or any Valentine display you love! My choice of corks were strictly reserved for the natural cork this time vs. the newer synthetic corks. As far as wine is concerned, I understand that the newer, synthetic corks are actually more effective in preserving the wine, but for crafting, this girl is old school, and desires REAL cork. I love the texture, the cracks and crevasses, each vineyards topography printed on the porous cork, and the saturation and depth of color tints from the wine these corks once guarded secure. I hope you have fun creating your own Valentine Cork Heart for yourself! Share a pic with me if you do ! Kim–no worries! When I turned 50, my daughter said, “Wow! 50! I thought you were only 42! You’ll always be 42 to me” Well, apparently, I was 42 wehn she finally realized how old I was, so what’s wrong with 42? You’ll alwasys be 42 to her now–even when you (gasp!) 59. Happy Birthday. Happy Birthday, whatever number you choose to celebrate! Cheers! Thanks Pat, what a great quote! That day was just a rough one. It started out with a migraine and ended with a birthday party. I think I was just overly tired and extra emotional. Thanks for the encouragement! How about celebrating your 22nd Anniversary of your 21st Birthday?! That’s what I do, so I’m only 27! This is a great idea! I have a ton of corks begging to be used. I’d love for you to share this at The Makers. Hope to see you there! Happy Birthday! You’re daughter is gorgeous, at first I thought it was a photo of Jessica Alba, she looks like a movie star! I love the cork heart and how you have it standing on it’s side. I used to collect them, but then I gave up on it because I wasn’t sure where to store them, but now that I am starting to collect mason jars that might be a good place! Hi Diana! Thanks so much for the kind words! My daughter will be thrilled to hear she looks like Jessica Alba, ;). Thanks for stopping by! Happy Belated Birthday! You are rocking 43, seriously! I love your wine cork heart and can think of so many ways that it could be displayed. Aww, thank you Paula! you are always such a sweetheart! What a great idea! It’s so creative and fun! Thanks for sharing at the Twirl & Take a Bow Party. Stop by Tuesday to see it featured! Oh wow! Thanks so much Leslie! 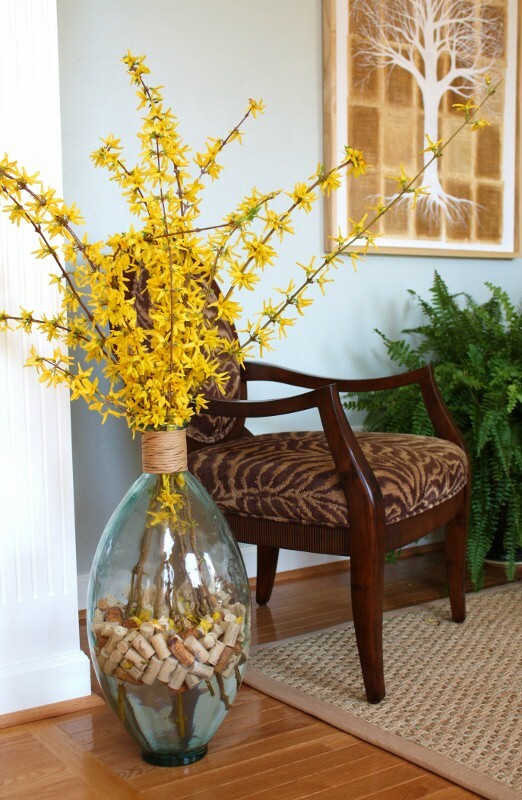 This is such a pretty craft… I’ve been meaning to pick up corks. We have one or two special ones kicking around, but I love the way you decorate with yours and the warmth they add to a room. I totally want to do this project! Thanks Brandi! It was so easy and having them displayed like this brings up wonderful memories of special dinners hubs took me to! 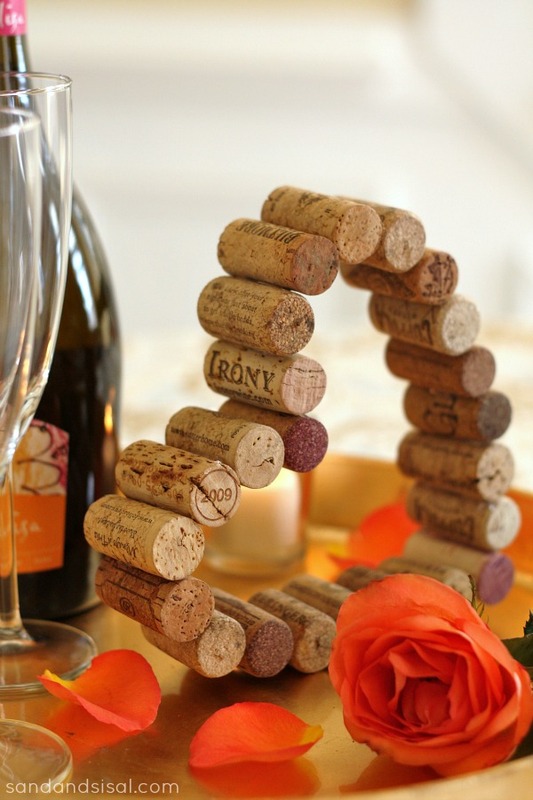 What a fun way to upcycle corks! I like the clever way you created the heart shape too. Hi Kim! You’re daughter is beautiful. I have an upcoming birthday on 2-10 and will be 57 years old. You should never let your age bother you, as it’s something that we all have to accept. I always like to think we get better with age!!! I love your heart design using corks and can’t believe I’ve never thought of it before. Keep up your great work and accept that we are like fine wine! LOL. Have a blessed year. I luv this heart!!!!!! I am having the time of my life and I’m ( Molly Shannon voice) ” 57″ . Have fun and enjoy all that you can. Cheers “clink clink” and here’s to more crafts with corks! Hi Kayla. I’m sorry you are having troubles. 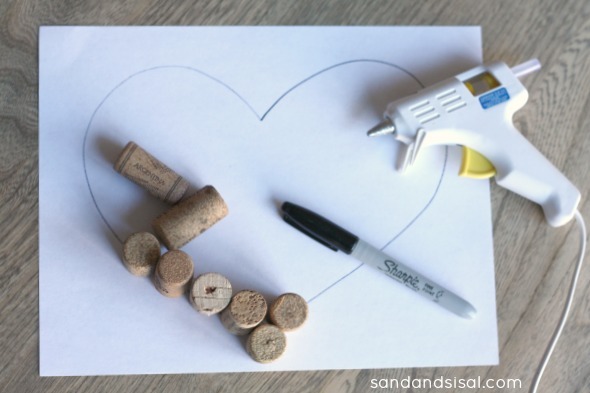 Try applying hot glue to one cork and then lower it into formation next to the cork standing on the heart you drew on paper. Wait 30 seconds at least to allow for the hot glue to cool and set and then glue your next cork with out trying to lift any of the corks on the drawn heart. Only lift it up when the entire cork heart is finished. I am having the same trouble with the corks falling apart. After my first attempt I made my heart shape smaller and that helped. BUT after a few days, it fell apart. I’m wondering if I need a new glue gun or stronger glue sticks???? I did a search on how to glue corks and saw a suggestion to use super glue….well, that didn’t work at all. Oh wow, that is crazy weird! Mine stayed just fine (until my 8 yr old starting playing with it). Make sure your corks are actual cork and not that new plastic type cork and maybe switch over to a high heat glue gun. Also do not place it in direct sunshine or on a mantle. The heat from the sun/fire might cause the hot glue to soften. Hope that helps! I found that if I sanded the cork and/or made cross-hatch cuts across it with a serrated knife (watch your fingers), the glue would stick better. There’s something on the outside of the faux corks that prevents the glue from making a good bond. Great tip Sara! I used all real corks for that reason. I just made 4 of these to give to my friends for a valentine’s get together I am attending. They turned out so cute! I think I am going to tie some Valentine ribbon around it with a bow. What a nice friend you are! That sounds so cute! Hi, I love this idea!! How durable/strong is this after the hot glue? Do you feel the need to reinforce with glue in the inside of the heart just in case, or does it seem strong?? Just wondering because I’m a klutz and everything needs reinforcing, especially DIY projects! Thanks! 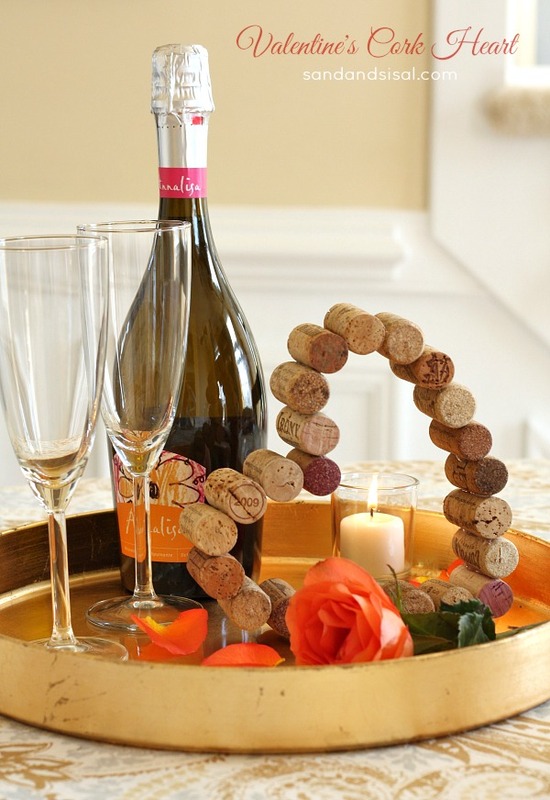 Loved the idea, but my corks would not stay together!? I’m sorry. Did you use real corks or synthetic? Synthetic will not hold. Also high temp hot glue works better vs. low temp.